A small room can be challenging to decorate, especially if you have a tight budget. Buying many small pieces of furniture can make it seem crowded and cluttered. At the same, large furniture will take all the space leaving little room to move around. It’s important to keep the right balance in everything. What is your best advice on how to arrange a small room to make it comfortable and pretty, even with a low budget? We received some great tips that you can read below. Decorating a small room is actually an exciting challenge and a compact room doesn’t mean you can’t have fun with space and design – and who said finding artisan, designer lamps online couldn’t be both beautiful and affordable? Before making a start it is worth spending time de-cluttering, leaving only the essential or poignant pieces you want to keep in the room. From there you can establish the amount of storage needed. Clever storage can make such a difference. A common mistake is making shelving too deep, so many things only actually require 10cm or less. Consider utilizing the space with floor to ceiling storage. If you have an unavoidable large volume of ‘stuff’ consider concealed storage to give the impression of a clutter-free space, and keep only the precious items, artwork, and pictures on view. Considering colors in a small room – I always think you should be bold and convincing but always have a thread or theme that pulls the scheme together. The key here is consistency. Play with scale and use larger patterns in smaller spaces to trick the eye. A common mistake is making shelving too deep, so many things only actually require 10cm or less. Place lamps and lighting at different heights using varied beam angles. Some are ment to provide full, global light and others directed at specific focal points of special collected pieces of art or sculpture from your travels. Mirrors can then marry the light and space together allowing the colors and light to converge, as well as, to reflect natural light and expand the feeling of space. Sometimes small mirrors in decorative, special frames work much better than a large rectangle. Before you begin the process of redecorating your small room, find an image that you love that feels spacious. Pinterest and Houzz have thousands of inspirational photos for you to fall down the rabbit hole. Make sure the room you find is similar to your own space in shape layout. Is it a square or a long rectangle, high ceilings or low? Then pay attentions to what’s going on in that space – what type of furniture, how it’s arranged, color scheme, etc. Next, you’ll want to move everything out of your room and declutter. Keep only the things that you love and make you happy everyday, and clean out any old and unused items. This will not only make your room feel more spacious, but you’ll also have an emotional release of letting things go. When looking for furniture, find pieces that are adaptable, have storage, and are multi-functional. Use wasted wall and door space by storing vertically. Hanging drapes as high as possible make trick the eye into thinking the room is taller than it is. Make sure everything has a place to call home. This will keep small items out of sight and will create a routine of putting things away after they’re used. Organize drawers, maximize closets and compartmentalize. If you have limited space but still want some drama, paint the ceiling a dark contrasting color, like indigo, black or something bold like berry. It will help your space feel expansive. Hopefully, there are windows which allow for natural light to flood the space. However, if windows are limited, layer your light sources. Add a chandelier, table lamp or accent lighting. Mirrors are also a great way to bounce light around a room and make the space feel much larger. Based in Hong Kong, with some of the smallest living spaces in the world – we get asked this question quite a lot! Our number one tip – learn from the Japanese. Japan also has some of the smallest living spaces in the world and they have become very creative at making the most of these spaces. Clutter is the enemy of a sense of space, so one of the key things is building storage into otherwise un-utilized spaces. Some good examples are drawers in flights of stairs, raising an area of floor with a wooden stage to create storage beneath and also hidden ceiling storage. Not everyone has the opportunity to purpose build their living space, but there are plenty of other things you can do to create a sense of space. Dark spaces tend to absorb light which makes spaces look smaller, so do everything you can to lighten the space – if you don’t have great natural light, make sure you have decent lighting to brighten the space. Designer lamps can compliment a small space in other ways – drawing the eye upwards creates a lofty space, so an attractive modern lighting feature that focuses attention upwards can really help. A lot of designers talk about using larger (but fewer) pieces of furniture – related to this, we also find that using large framed prints and wall art helps with the sense of grandeur and space. Rugs are also a great way to define areas of space within a smaller room, giving the sense of a larger space. Finally, don’t be afraid to break the rules. For example, we’re conditioned to think a lounge setting must include a sofa and coffee table. But often coffee tables become just a place to accumulate clutter and can be easily replaced by a side table for resting that mug of coffee or glass of wine. Small compromises like this can really open up a space. ORGANIZE! Small spaces can get cluttered and messy in a hurry. That’s why it’s important whenever possible to create sensible storage solutions so that everything stays organized and accessible. When it comes to organization, in addition to new items, I also prefer using/repurposing ordinary household items into wonderful and useful organizational tools. Use multi functional items – for example, there are beds that can also be used as sofas. Bed by night and sofa by day with a huge benefit of not taking up a lot of space. There are also cocktail tables that can act as dining room tables because they have a lift up mechanism. Use light colors for wall décor and furniture since lighter colors are less imposing and create a light and airy feel. Use furniture pieces with small features – for example, sofas with skinny backs and arms or beds with a thin headboard. They take up less space, don’t overcrowd the room, and overall are very efficient when space is a consideration. If you’d like to make your room pretty and comfortable on a low budget, try using some of the principles of Feng Shui. Do a thorough cleaning and get rid of all the clutter. Anything that has been sitting there for a while that you don’t need or don’t love, get rid of it. Make sure you have good air quality and lighting. Use plants to purify the air or purchase an air purifier. When possible, make use of the natural light coming in through your windows instead of lamps. Position your bed with the feet toward the door. Place a chest or bureau opposite the bed. Try to incorporate the 5 natural elements into the room: Those include fire, water, earth, wood, and metal. Most rooms in your house have 1 or more of these elements already present in the room depending on how it was constructed and the furniture that’s already in there. Try to find ways of incorporating the remaining elements using furniture, accessories, etc. For example, plants, water fountains, wooden chest, candles, etc. If you can’t find something to physically represent the element, try hanging a picture or a painting as an alternative. If you’re struggling, try searching for a Feng Shui consultant in your local area. Paint or wallpaper the ceiling to make the room appear larger. Rules Are Made To Be Broken: In smaller rooms, people tend to shy away from warm hues such as blacks, dark grays. When designing small spaces a love to paint vertical stripes on a focal wall in a warm color hue to give the illusion of a larger space instead of using a lighter color that is expected. Floors: Keep floors in a neutral color palette to give the appearance of a larger space. Artwork: “Go Big or Go Home”: Hang a wall to wall mural on a focal wall or choose large scale artwork that will make the room appear larger. Furniture: When choosing furniture for small spaces in living rooms choose an l-shaped sofa instead of a matchy-matchy sofa/loveseat combination to make the room appear larger, Floating Effect: make sure that the legs on the sofa are exposed to create what we designers call a “floating effect” to make a small space appear even larger. Choose coffee tables or ottomans, that are multifunctional and contain hidden compartments that can be utilized for extra storage. Incorporate glass or lucite furniture pieces such as desks, console tables, and benches to accentuate the illusion of a larger space. Lighting: To create continuity, install a glass or lucite lighting that will make a statement and carry the look throughout the space. In addition to installing a chandelier to make a statement incorporate recessed lighting, and lamps to add ambiance and the appearance of a larger space. Make an assessment of how you’d like the room to function, even small rooms can have multiple purposes. Think about how many people would be using this room at one time, and how you would seat or accommodate them. Once you have the max load and utility issues solved, you can advance to the next phase. Layout. It is so important to use every square inch in a small space. Draft a room drawing and always keep it with you. You never know when you’re going to stumble across the perfect piece for your room and you won’t know if it is going to fit in the space if you don’t have your dimensions handy. This also applies to colors swatches – everything from paint, fabrics, and surface finishes. Know your style. Bohemian or Bauhaus, hone in on whatever whets your style palette, I like to mix design elements as long as the color scheme coordinates in the small space. You can really pull off a great room with the right blend of decor. Again, if you love the pieces you are selecting, and it dimensionally fits, it will make the room visually appealing and inviting. You can have it all. Allow for different lighting, layering, cocktail tables, side tables, small ottomans, area rugs, artworks etc. Just because space is small doesn’t mean you have to cut down on pieces, they just have to fit the space and be moveable. I once designed a space to comfortably seat 9 in one room of a 525 sq ft condo. Colour is key. Whether it be a feature paint or wall covering that is eye-catching, or a subtle drapery treatment that spans an entire wall making space feel larger, color plays a huge role. For really small spaces, I like to paint the farthest wall away from the entry door a dark receding color, this makes space feel like it goes on forever. I also like to have little punchy hits of vibrant color in the center of a room, so that the eye goes to that and not to the perimeter of the small space. I am really quite fond of homochromatic palettes in small spaces, with 2 to 3 accent colors. This also makes a small space appear larger. Arranging a smaller room on a budget is simpler than it seems with a few easy steps to get you going. When selecting a color palette, go for light and bright colors as darker, busier tones often make a room look smaller than it actually is. Additionally, use mirrors where you can as they visually expand a room—bonus points if pointed toward natural light! Consider strategically layering lighting, like a statement chandelier balanced by stylish table lamps, or a pair of pendants offset by recessed lighting. The cherry on top? Edit, edit, edit. Stow away unnecessary clutter for clean sight lines and an overall simpler look. Think light and airy. Painting the walls a light neutral color will expand the space visually. Embrace as much natural lighting as the room allows! Don’t cover the windows with that dark, somewhat dingy, tapestry your grandmother gave you. Instead, opt for sheer panels to keep the space open, do not be afraid of color here. It is acceptable to choose a color other than white for your sheers, but don’t go too dark, pick a happy medium. In fact, choosing sheer panels the same color as your walls make your room seem even bigger. Use mirrors in your small space, the reflection will make space look bigger. Using smaller printed fabrics allows your eye to enjoy the delicacy and movement of the print, instead of having the print be too overbearing and making space feel too crowded. Choosing patterns that aren’t so busy, especially in color, will visually expand your room. So check out patterns with more unified color schemes. Use mirrors in your small space, the reflection will make space look bigger. This tip is an oldie, but a goodie. Hanging small mirrors in a grouping, or leaning a full-length mirror against the wall, will reflect the lighting and make your room appear bigger. My best advice would be to implement a “holistic thinking”. For arranging a small room beautifully the first step I would suggest is to understand clearly the use you want for that room and the expectations you have, how do you want to enjoy it?. With this in mind, you will be able to check if the style you have thought of suits the space in terms of look, feel and very importantly: proportions. Working on the furniture layout will help you to solve this. A comfortable room relies on the freedom you will have to move at ease and how the furniture, soft furniture, light, colors, art, and accessories make you feel when experiencing them: Are the chairs comfortable enough? Is the light soft and welcoming enough (warmth)? Is the art pleasing your senses? Are the colors giving you that embracing feel? The idea of the interior should not be to challenge you but to indulge you and for that, you don’t need a big budget but the right ideas; the pieces you can acquire from different sources: shops, family, vintage or charity shops, etc. Lighting – always very important and could not be compromised – recessed or mounted, as well as centerpieces like chandeliers, floor, and table lamps. There are many quality replicas of European famous brands which will become the main visual anchor of any room. Plus natural light absolutely for free 🙂 You can also add LED lighting – an inexpensive, yet rich looking touch. Wall treatment – always a matter of personal preferences, but normally, bigger surfaces – wallpaper accents, smaller surfaces – paint as a background. This allows to use expensive wallpaper, but also save the budget and create an aesthetically pleasing mix of surfaces. Furniture – pretty much same approach – a smart mix of more expensive and cheaper brands, including replicas and even Ikea – if you know how to mix everything tastefully, it will work very naturally. Especially when transitional style and tasteful eclectics are the main trends and a great way to achieve a unique and harmonious space. Doors, hardware, trim casing, and moldings – depending on the style and available budget, doors (preferably flat as the simplest way to not make a mistake, especially when on a budget), trim casing, base moldings and crown moldings are a good touch. Otherwise, leave it as is and possibly paint the same color with walls to blend. Finally, window treatment – like a picture frame, organizing and holding the entire painting together. White on white is a rich looking and very safe combination that works with any style and in this case can easily be Ikea. Here’s an example to illustrate my thoughts nicely – this entire interior is under 3K. Using creative ideas, you can make a small room appear larger. Be brave and try using wallpaper on the ceiling or an easier option is to paint the ceiling a different color. It will add more height to the room. Also, the use of stripes on the floor will make the room appear longer, trying using a monochrome striped rug. To give the room more depth, leave the window uncovered if possible. If you need privacy, try a roller blind, that can be kept rolled up during the day, but lowered to add privacy when needed. Then dress the window with floor length sheer fabrics to drape the window. Avoid using ceiling lights, try opting for a few small lamps around the room, it will draw your eye around the room. Another illusion you can do is to put a mirror on the wall opposite the window, it will make the room appear more bright and airy. The key to designing a small space regardless of the budget is to minimize contrast and maximize versatility and function. Keeping a room, in one color or tonal whether it be all white or all black, prevents the eye from defining space and scale that contrast creates. We routinely prefer to choose a rich dark color scheme in a small room as the walls recede and by keeping the major furniture pieces in the room in that same hue, we prevent the eye from recognizing where one piece starts and the other stops. This includes painting out trim, ceilings, and doors in the same color. Minimize contrast and maximize versatility and function. Mirrors are also a fantastic way to expand a space on a budget. Placed near a window, they will help to create the illusion that there are more windows in the room and add a great expanse to the room. In some cases, we will mimic the windows themselves to fool you into thinking that there is an extra window in the space. If you are open to pattern, large over-scaled patterns, particular in drapery panels can add volume to a room that expands the space visually. Depending on how much light your room gets, implementing dramatic colors can greatly enhance the overall feel and atmosphere. Combine purple foyer walls with oily yellow a dash of dense red or even mellow blue (works great on floors). If your room has less sunlight – turn a downside to a positive and use to make it as cozier as possible! Furnishing should have more than a single purpose! Drawers on the side or storage beneath the seats. The more you squeeze in, the more you squeeze out! Another clever choice is ready to assemble furniture. Flat packs are amazing when it comes down to “hacking” and adding extra functionality. A great tip is to put near sealing space to use, by hanging shelves and lighting. You will not only save on floor space, but you’ll add another dash of coziness to your interior. To hang a few extra mirrors throughout your room is the best way “widen” it. When it comes to interior design, mirrors bring in the illusion of increased square footage. If you use a handful of smaller mirrors you will intensify the way light affects the overall atmosphere, while hanging a single but bigger mirror will add the feeling of extra space. Tip 3: Multi-Function Furniture: These pieces will save you on square footage. Purchase an affordable table that doubles as a desk, then added decorated storage cubes underneath, with room for a filing cabinet. You can even use a cute decorative tray with color glasses to also serve as a bar cart! When it comes to a small space, keep the eye focused and don’t overwhelm with too much information. Sticking to one to two colors, and similar patterns, decor items, and themes is key for creating a styled space that doesn’t look cluttered. Repetition is your friend. You don’t have to match (and definitely don’t want to be too matchy), but stick to a color palette and run with it. The biggest tip to make your small space feel big, buy furniture and decor pieces proportional to the size of your room. For example, if you have a small living room, don’t stuff it with an oversized sectional and fluffy recliners. Space will feel crammed, not cozy. Stick to low profile (think mid-century modern or Scandinavian design) pieces. Sofas with low backs, legs, and tufted cushions. Small accent chairs. Any furniture with legs is good, this will allow you to see more of the floor and the space will feel more open. Some of my best statement pieces have also been the least expensive. For example, the accent chairs in her living room were purchased at Goodwill. The staff there didn’t know the chairs were designer antiques. All it took to bring them up to their former glory was a good cleaning. Don’t be afraid to take on a small DIY project and make a thrift store find the highlight of your room. This final tip will save you space and money! Don’t feel the need to over purchase for your small space. Investing in a few cohesive necessary pieces will serve you better than over investing in an array of clutter. A small space doesn’t need to be filled like a large one to feel cozy. Take a minimalist approach, and get things with warm colors and textures to make it a cozy feel. You don’t have to spend a lot of money to create a warm and inviting space. Start with arranging your furniture. You want to set up a conversational area that faces you when you walk in the room. For example, have the front of your couch facing the door as opposed to the back of it. If you have a couple of chairs face them in towards the couch. A soft area rug can warm up any space and really complete the look of a room without having to spend a lot of money. Also, candles and fresh flowers (even from your garden) really go a long way! Design is a never ending process – you’ll always want to change and add different elements in a space, so don’t feel pressured to have it all figured out the first time around. Have fun with it! Choosing soft colors on the walls such as beige, champagne will make space look bigger, and avoid using dark colors such as black and dark grays. Adding mirrors will make the room look bigger and where possible maximize natural light such as floor to ceiling windows. Choose furniture that can be used for different purposes such as ottomans, which can be used as a coffee table and an extra seat. Sofa beds are also a good idea to convert the living room into a bedroom when needed. Add floor to ceiling joinery where ever possible as this will expand how low the room looks. My favorite way to style a small space is to focus on a few great pieces of furniture, accessorized beautifully with pretty accents. For instance, a beautiful white marble side table styled alongside a gray velvet tub chair pulled together with a few accent accessories in pretty blush hues. You don’t need a lot, just good quality furniture (new or vintage) and a few pretty accents. I work with a lot of clients in cities, so space (and budget!) is often tight. One of my best pieces of advice is to choose one or two pieces to invest in like a quality sofa and get creative with the rest to maximize your budget. Spending as much as you can comfortably afford on a piece you’ll use all the time will be well worth it! Then, make good use of wallet-friendly places like Target and Wayfair to fill in the gaps when it comes to the rest of the furniture and decor – they carry a lot of well-designed pieces at affordable prices. Also, in a small space, don’t be afraid to use a large rug. It grounds the rest of the furniture, will be very cozy underfoot, and can actually make a small room look larger! Utilize tall, narrow furniture with clean silhouettes and breathing space between room elements. If you can’t scale out, scale up. For example, even your lamps can be narrow to give the perception of room depth by drawing the eye upward. Utilize complimentary shapes to your advantage. Rectangles complement rectangles. Circles complement squares. For a wood floor apartment, building around a runner rug is smart. For square rooms, you can create a sense of inclusiveness with a circular rug. Tap into the power of asymmetrical design. Something like a narrow stacking C-table not only gives you options – the asymmetry of the piece creates flow and airiness. Create a focal point. Since you don’t have much room to work with, choose one fantastic focal point to not only draw attention towards beauty but show your personality. Choose reflective, light-colored paint for your walls to not only make a room brighter but bigger. To open up a small room – use the same flooring in your room as in adjacent rooms to immediately make it look larger. Doing the opposite will actually make it feel smaller. This one is near and dear to my heart! Hanging lots of mirrors on your wall will always double your space. Feel free to use them at floor-level too where they can maximize the light in small spaces. Unused spaces such as nooks and pantries can be transformed into an instant home office by adding DIY wall shelves. The easiest way to do this is by installing a counter or table top in the space and then adding a computer and chair. Paint door trims and skirts so they blend into the room and open it more. This contrast makes space look more vibrant and is an eye-pleasing detail. Keeping window covering the same color or shade as your walls. And hang your curtains high (ceiling to floor) to give the illusion of height to your walls. This is a classic but works very well. Use a smaller-sized settee rather than a sofa. It is less intrusive in space-challenged rooms while still comfortable for guests to sit on. Oversized furniture is a relic of the past. Less and more minimalism is a great way to expand a room’s feel. Use wall-mounted lights instead of table lamps unless you have a table. This can quickly de-clutter your already small space. When buying floor lamps, go for the models with smaller bases to save on floor space. Space-challenged rooms just need a little extra love. Most people may not know until they are living in a small space that there’s an entire line of compact furniture that is made for and looks better, in a small room. For example, a table set including a coffee table and end tables, are created in a smaller scale that would look silly and minuscule in a bigger room. And everyone loves saving money and when you don’t have to buy as many pieces for space, that’s excellent news for your budget! Decorating a small room is more challenging than when you have a big space, but it’s not an impossible task. The walls should have a pale or neutral color as this will make the room look brighter. Don’t include a lot of small pieces of furniture that will overwhelm you and make the room look crowded. A convertible couch may be more appropriate because it occupies less space during the day, and it turns into a full bed at night. A painting on one of the walls will make the room look prettier and trendy. Then you have to check your options for storage. Ultimately, it all depends on how you want to use the room. Is it a guest bedroom that will be used rarely? Or is someone living in the bedroom full-time? In small spaces there are a lot of elements that can make it more elegant, natural light is a big factor but also color. So many people are scared of dark colors and while light colors can make a room feel brighter so can dark colors! Natural light is a big factor but also color. With the right light accents and contrasting colors, the dark wall or elements become brighter and trick the eye and also make a more interesting space! Try first by painting a focal wall a darker but neutral color (NOT bright red) and then layering it with contrasting artwork, from there add different levels of lighting, pillows and soft goods to make a cozy space. You will see how much more comfortable space will feel. Small rooms offer their own set of issues – and the key is to know how to work around them to make the most of the space. Ideally start with a neutral background for the larger items in the room (the wall color, floor color, and the sofa). This will help the room feel larger because your eye won’t fall on any of them, it will simply move around the room more freely. For window dressings, I always like to use shutters because these take up the least space in the room and make it feel much larger and contemporary. Add lamps to the room also – this will give layers of light and create a gorgeous feel. It will also brighten up each corner and make the room appear larger. Once all these things are in place then go for your own color and style in any artwork and accessories. Using metallics will help reflect light again around the room, and framed pictures will also reflect light in the glass. One of the most cost effective ways to change the look of your home is to declutter. When people enter your home and see a clutter-free and open hall or mudroom they are immediately impressed. Additionally, remove excess furniture (the chair you took from your parents’ house when they moved to Arizona) and items like the magazine/newspaper rack/pile to create open and flow friendly space. Rethink if some of the area rugs should be removed to brighten the room and make it appear bigger. From a design point of view review the curtains and replace if they are faded or dark. New curtains can open up a dark room. Use a properly sized area rug. There is nothing worse than seeing an area rug that is too small in a room. It looks like a postage stamp and totally ruins the space. A good rule of thumb is that a rug should be large enough to have at least the front two legs of each piece of furniture on it. Color and pattern are two ways to make a big impact on a low budget. This helps to pull the room together creating a more cozy and complete atmosphere. If you already own a good quality rug that is too small and aren’t looking to purchase a new larger one, a good budget hack is to buy a larger inexpensive jute or sisal rug that you can be placed underneath the smaller rug you already own. This will help you achieve the same effect without splurging on a larger better quality area rug. Color and pattern are two ways to make a big impact on a low budget. Adding a little color to your walls, or a stylish removable wallpaper is a great way to bring in personability at a low cost. It will have a guaranteed effect on both the look and feel of your space. Add a rug – another word for feet’s heaven. Whether your floor is already covered, a rug can always bring more style, color, and softness. Available in different shapes and colors – rugs will definitely reward your tired feet and make your property feels like home more than ever. Hang up illuminated photos – let your best memories glow. Really cheap and effective trick to bring more life into the bedroom or living room. Hang your favorite photos alongside twinkle lights and during the night you will have a really warm source of light. I would first declutter the room anything you don’t like value or use and remove it be absolutely ruthless and take it to the charity shop. I would then decorate it with a decent sized and mirror that makes a statement to make the room appear larger and also avoid too many patterns. For small spaces, statement lighting is an ideal way to make a big impact on a tight footprint. Look for creative lighting solutions that bring artistry to this far too-often-ignored accessory. The best lighting merges form and function, delivering a double impact of character and luminosity to your space. This is a great solution for people who crave a dose of personality to light up their room. With custom lampshades, you can transform your most captivating photographs into fine art lighting. Anytime you’re arranging a room, no matter how big or small, storage is key. Wall space is often underutilized. Wall space is often underutilized. Spaces above doors and windows are perfect for hanging hats, baskets, or shelves to put books or trinkets on. You can’t really have too much shelving. With some good Command hooks, you can hang wicker baskets to create an awesome ‘shelf’ on any wall. If you want to hang things that are heavier, you can install rods and hang baskets that way. These aren’t just for towels in the bathroom. Oh no, you can use these to store anything you need! Shoes, accessories, books, or trinkets. You name it, you can probably use these. Depending on the type of room you have, you can use a shelf too. If your small space is more of a studio apartment, using a dividing wall is key to separating your bedroom from the rest of the room. Plus, this shelf here is not only a divider, it’s a great place to store your stuff. If you’re a crafter, then a peg board is definitely for you. It’s such a great place to store yarn. However, if you aren’t a crafter, well a peg board wall can still be for you. You can buy or make buckets, containers, and shelves that attach and create your own personalized shelving space that can be rearranged as needed to fit your items. Cut the Clutter: Clutter accumulates easily, which is especially devastating in a small room. The clutter detracts from the room’s decor and creates visual and physical stress. Reduce stress and allow a room’s beauty to shine by throwing out unnecessary clutter and organizing the rest of the clutter in visually attractive storage containers: toys should go in closed containers (either round or square), magazines should go in baskets, keys and other small items can be put in small ceramic bowls. Let the Light In: Strategically placing a mirror in a room can make the room appear bigger and allows more natural light to circulate, instantly adding energy and beauty to the room. For example, large mirrors work great in small rooms and making a mirror a focal point will open up the room. Beds: A bunk bed for your children’s room. A loft bed above your home office will save space. Opt for multi purpose furniture. A sofa that turns into a bed or a Murphy bed, are also great solutions. A captain’s bed is also a good idea for the children’s room, one bed is shown and the other one is hidden underneath it. Wardrobes: A wardrobe with glass doors will make your small room feel like it is larger by showing the other end of the room. Affordable furniture of all kinds can be bought from stores such as IKEA. Curtains or Blinds: Opt for blinds because drapes’ heaviness can make your room seem even smaller. Or if you insist on curtains, buy lightweight ones in light colors. Colors: Any small room, be it a bedroom, a kitchen, or a living room should be in light colors. Dark colors make for a dark room, and a small dark room is not cozy or inviting at all. Clutter: Keep it to a minimum. Too many things in a small room will give the sense that it is even smaller. This can be achieved, not necessarily by getting rid of your belongings, but by using closed shelving as a solution to hide the clutter. Also, if you are a fan of wall art, my advice is to opt for one big piece of art instead of many small pictures on one wall. To make a small room feel more spacious, try to get as many items off the floor as possible. Add a couple of small shelves next to the bed instead of bedside tables, and try to choose a bed with legs so that you can see the space beneath. Seeing more of the floor gives the illusion of more space in the room – just don’t store a load of clutter under the bed! If you haven’t got a room for a dining table or desk, you could install a drop-down wall table to provide space for both of these activities. It can then be folded down when not being used, creating more space day-to-day. When dealing with a small room, it is important to keep the focus very precise and choose only required items to occupy the space. Lighting and mirrors can be a great addition however if they are done wrong (or are too small) they can have the opposite effect. I’ve seen a small room with a large mirror give the impression of being large but once inside it felt awkward and confining. I recommend only putting in 1 larger piece of furniture, typically reserved for seating. A large single chair in the case of a reading nook or a great and comfy couch. If additional seating is needed, I would only add a small or wooden chair. Pictures on the wall should be small, any plants should be manicured and tidy. Speaking of tidy- it is VITAL to keep the room clean, free of clutter, and easily put back in place after using. Only put 1 larger piece of furniture, typically seating. Besides the 1 large piece, all other furniture should be small and slender. Shorter is better but make sure everything “fits” together in design. Hodgepodge furniture only adds to the feeling of clutter. Use light colors in painting the walls but not white- I think white removes “dimension” or feels like a closet. Small rooms are beautifully simple, cozy, and serene when done right. I always recommend starting with a light, neutral color like white, cream, or misty gray. White walls will open up space and bounce natural light around, making the room feel larger and more inviting. And research has shown that white rooms are known to help you experience restfulness, calm and joy. Also keep flooring, wall and ceiling materials and colors consistent throughout your space for a seamless look that tricks the eye into traveling further without stopping. There’s nothing worse than chopping an already small space into smaller pieces by changing flooring or wall color from the entry-to-kitchen-to-living area. Good lighting is also essential for dark days and evenings. Having good task and ambient lighting through a mix of floor and table lamps as well as overhead or hanging lights is a must for a restful, warm, yet open feel. Finally, don’t be afraid to use large pieces of furniture. A couple of large pieces work much better than a lot of small pieces to make a room feel roomier. And choose furniture with open legs that are visually less bulky. I live in a small home by myself and recently completed a restyling that really changed its look a look. I basically worked on colors, by changing floor and wall paint with light colors (white/light gray). I also did a huge declutter by removing all useless things. I finally rearranged the layout in order to open more space. My advice is to always start by creating a concept for the room in question and properly plan for space. This holds especially true if the room is very small. The three main points to consider are proportions, colors, and lighting. Think about how you will use the space and then decide on the furniture you need. By all means, avoid bulky furniture and instead go for ‘light’ furniture. Also, try to keep things off the floor wherever possible, for example by hanging storage units and shelves on the walls. The three main points to consider are proportions, colors, and lighting. Personally, I like to work with light colors for small spaces. Pastels and monochromatic schemes work particularly well. Another advantage of light colors is that they reflect more light, which brings me to the third point. Lighting is crucial in any environment and it can make or break the entire design. You will want to maximize daylight, but also add multiple sources of lights to create some ambiance. Use dimmable lights wherever possible to give you even more flexibility. Identify furniture that conforms to the scale of the room. Antique furniture can be a great source, as many of the pieces were made to fit smaller interiors. The most important thing to incorporate into your small room is a clever storage solution, making sure that your belongings can be stored away neatly and not take up valuable surface space. If it’s a bedroom, you can utilize the area under the bed. Built-in ceiling height shelving units are great for living rooms and dining rooms, along with chests that can be used as coffee tables as well as storage. You should also choose white or light colored soft furnishings to make space seem larger and airier. Steer away from thick, heavy materials, which may overcrowd the room. I also recommended zoning off the room into several smaller sections, making the most of every inch available. Don’t feel pressured to place furniture against walls. As long as you have enough room to move between pieces, you can arrange it however you please, whether that’s in the center of the room or at jaunty angles. One or two key design features, a feature wall or a piece of art highlighted by an equally stunning wall light from renowned brands like Tom Raffield, will also bring depth and interest space without cluttering it up. To style and decorate a small room beautifully, give it the illusion of size. Although it’s small some smart tips and tricks can make it feel much bigger. Below are three things that you should consider. Colors: Use light and neutral colors throughout, from the walls to the furniture. Light colored neutrals reflect light and make space feel larger. Paint is one of the most affordable ways to decorate a room beautifully. Lighting: Use soft but white, natural looking bulbs to create an even layer of light across the room. Add accent shades by using small table lamps or a single pedestal lamp. This will create ‘layering’ with the light allowing you to change the room from feeling airy to cozy in a minute. Furniture: Choose a theme (for example all modern, all classic and traditional or all Scandinavian minimalist) for furniture across the room and make sure everything is consistent. This will create a uniform look that can make space feel bigger, whereas having different styles of furniture in a small space can appear busy. Vignette: Keep the décor in a small room to a minimum to avoid feeling cluttered, but add one vignette or focal point by combining some coffee table books, a small plant and a photograph in a grouped color scheme to give it some personality and style. Arranging a small room can be tricky, as sometimes it’s not easy to get a good amount of natural light into such a small space. Use stylish lamps to ensure you can get as much light as possible and then make the space cozy by adding comfy cushions, throws, and soft furnishings. Add a touch of personalization to the room by putting up some motivational wall art or family photos. Colour wise, I would recommend sticking to pale and neutral colors such as white or pale gray, as dark colors can make a small room look even smaller. You can always add pops of color by including some pretty trinkets and home accessories in the room, which can be easily updated depending on your mood. Make the most of the space that you have by using clever space saving furniture such as an ottoman which can be used for storage, which can then be doubled up as a coffee table in a living room. I would also suggest browsing Pinterest for interior ideas, as it’s full of bright ideas! First of all, if you are looking for a big transformation, but on a budget, think what you already have in the room that you really like and that you could potentially reuse. For example, sofas, are usually a major expense- why not re-upholster them instead of buying new ones? Then, you can add some accessories, such as cute cushions, new side tables, and lamps, which would completely change the feel of the space. Secondly, choose the color scheme accordingly with the theme and style you’d like to achieve in the space. Make sure, the new colors match any existing items you’re sure you’re going to reuse. Don’t ignore the shell of the room- paint the walls a new color, and change the flooring if possible. Think about how many sources of light you’re actually going to use. Last, but not least, never ignore the lighting. When you decide to redo a small room, think about how many sources of light you’re actually going to use. Did you know that, as a guide, five to ten light sources, all on dimmer controls, can be sufficient, to effectively lit the space, depending on the interior? When designing lighting in a space, we must maintain a balance of different sources of light, and ideally think both creatively and practically about their use, direction, and control. In a small family lounge that has undergone a big transformation on a budget, since the family usually reads and watched TV in the room, we have decided task and ambient light was needed on dimmer controls, so we didn’t install any ceiling or wall lights; instead we used floor lamps which are connected to the main circuit and can be operated both from the main dimmer switch and from the switches attached to the lamps themselves. What a room lacks in size I like to make sure it makes up for in personality. In fact, small spaces are my favorite to decorate because you can really afford to go bold with your interior choices. It’s a great opportunity to invest in a statement or designer wallpaper that perhaps you wouldn’t be able to afford to go for in a bigger space. If it’s a bathroom, try something quirky to add a sense of humor to an otherwise functional space. Often small spaces can have a limited natural light so I would suggest making this a positive, rather than a negative situation. Go for bolder, dark colors and add dramatic lighting. In a small bedroom, go for an oversized pendant that draws the eye upwards, but don’t forget to add as many table lamps as possible to create a soothing ambiance. I’m a huge fan of feature wall lights and will ensure my next bathroom is fully wired up to accommodate mood lighting that so many great designs miss. You should start by ditching any bulky furniture that eats up space. Investing in some space saving furniture like a bed with clever storage compartments underneath, are an absolute must for any cramped room. Also taking the time to properly sort out your dressers or drawers will buy you some more space that you probably thought was not possible. And don’t forget to include your cupboard in your sort. It’s important and wise to milk every inch of storage space you have in there. It’s a tried and tested idea that’s very well known, but you really can’t go wrong with adding a mirror to a small room to add the illusion of more space. By using a mirror that’s the same length as the furniture will give it more prominence and not make it feel shoved in. Fewer, bigger pieces make a room look larger by reducing the clutter. 1) People tend to use too many small tables, consoles, sofas, chairs and other items they may have inherited from someone else or have stuck in their homes for too many years. The same principle goes for artwork and accessories. Try not to pile on too many small, unmatching picture frames, little vases, and art. 2) The right proportion of all items in your room is essential. You have to design according to room shape, ceiling height, and furniture size. One of the most common mistakes is using coffee tables and side tables that are too small or too big. Another area to watch is lamp height, relative to the table height and sofa. People worry about paint color making a room look small. But a small room is a small room and dark colors can actually make it look more interesting! With a small space, you have to put your minimalist mind into practice… keep it simple.Choose a light and simple color palette, and stick to it furiously. Choose one or two decorative pieces but don’t go overboard with trinkets and frills. We recently refinished our guest room on a tiny budget… pale yellow, white and gray. The bedding is pure white, one a bed, one nightstand and a simple wooden chair. There is an air of calm in there that is really quite magical. We were lucky that our guest room has incredible natural light from two windows on the sunny corner. However, for darker spaces, artificial lighting makes all the difference. If going minimal, you need to consider your lighting as integral to the decorative accent. Minimalism is all about designing with necessity; none of that functionless wall art is required. If you fill the room with pictures, fancy drapes and start adding lamps and pendants, it’s going to look cluttered. You really don’t need all that stuff… keep the fabrics and walls clean and pure in style, and add one single feature light to bring the space to life. Small rooms can be challenging; but simple, thoughtful designs create calming spaces while keeping the budget manageable. A good tip for a small bedroom would be to paint the walls and ceiling in a light reflective paint which can be sourced from your local DIY store. This affordable purchase contains light reflective properties which reflects twice as much light back into your room creating a sense of space and light in a small area. Use pale receding colors and incorporate stylish bed linen into your scheme for pattern and texture. I like to change my bed linen according to the seasons as a quick and inexpensive way to update the interior. Soft florals for Spring/Summer and warmer abstract prints for Winter. The most important consideration when designing a small room is scale. Appropriately sized furniture will give the illusion of a larger space. For example, select upholstery that is not too deep or wide. Find upholstery with built in back cushions. Many companies are designing sofas with upholstered metal frames allowing the full comfort of a deep sofa without the loss of ﬂoor space. In the case of a dining room use a narrower refractory table and perhaps think about a banquet or bench seat for one side. Not only do they allow you to sit more guests they create less visual noise than lots of chairs. Scale doesn’t necessarily mean small. A few large pieces of furniture will feel simpler. Think about custom. A furniture piece that ﬁts the space will maximise its use and appropriate scale. Keep it simple. Light is another important issue. A combination of lighting sources can help focus the eye and create depth. Don’t ﬂood the room with light as it will make you aware of the size of the entire space. A few well-placed lamps and pendants within a room and adjoining rooms will make the eye wander around, giving the illusion of more depth. It is a fallacy that light colors are vital to making space feel larger. Deep hues make walls disappear causing the elements within the room to become the focus and views out the windows to create depth. The color should not be a bright color like yellow or ﬁre engine red. Use a natural hue with a gray base like eucalyptus green or battle ship blue. These tones have complexed color bases that will seem to coordinate with many other colors. If you do have a large dark piece of furniture like a sofa or dining table, a deeper wall color will let it recede into the background rather than be the prominent visual piece. In small living spaces, we always try to incorporate a console table with x-benches. The small scale x-benches can live tucked under the console every day and be brought into the seating group if extra seating is needed when entertaining. Try to incorporate a console table with x-benches. Another way to maximize seating in a small space is by incorporating a built-in window seat. This adds a great architectural element to space but also provides functional storage and additional seating. And don’t forget the lighting: just because a room is small does not mean the lighting should be. An over-scaled light fixture makes a wonderful statement in a small space. The key to creating a small space that lives large is, to begin with, a neutral paint color with personality. For example, Sherwin-Williams color Rice Grain or Sherwin-Williams color Repose Gray are brilliant neutrals that lighten and brighten—adding visual square footage to a room. Paint is an easy and inexpensive fix that transforms a space on a budget. One last tip for decorating a small space is to select a paint with a satin sheen. This finish allows light to bounce off the walls, bringing an even more welcome and airy feeling to the room. Organizing a small room is a very difficult task because we usually own many things, and finding the space for everything is like an impossible mission. This is why the practical and aesthetical part of this task are often in conflict. However, this doesn’t mean you shouldn’t try. One thing, which works perfectly for small rooms, is the smart storage. You can use common containers like shoe boxes and jars to store small items, like sewing kits, coins, pens, and anything else that will otherwise wander around. Another trend, which is on the rise in the last few years, is folding furniture. It’s a little more expensive, but it’s worth in the end because you can fit furniture for a whole house in 1 small room. I love designing small spaces, it allows me to think about a room in an intimate way. A small room doesn’t mean that you have to compromise on comfort. I use regular scaled furnishings to create a cozy and livable room. That may sound counter-intuitive, but in reality, it’s important. I believe in not trying to hide the obvious, in this case, the fact the room is small, and play up to the room’s strengths instead. Using a monochromatic color scheme, I would highlight the room with warm, rich shades of the base color juxtaposing it with the lighter tones of the color on the main pieces, all in a play of textures. To give the room added drama, a pop of a new, bold color in strategic places, such as a pillow or two, a vase and an additional couple of accessories is all you need. It’s just enough to keep your eye moving through space. Once your eye is engaged, the room will no longer feel small…it will feel luxurious and inviting! I love dark and moody colors, but they can make a small space look smaller. If you’re trying to create a space that looks larger than it is, stick to light colors, especially for walls. In order to save space use light fixtures that are mounted on the ceiling or walls instead of table lamps or floor lamps. Wall sconces are a great way to light the space without cluttering tabletops. A large ceiling fixture can add a dramatic effect while helping space feel large and luxurious. I am a firm believer that no space in the home should be neglected, no matter what design challenges it poses at first glance. People tend to avoid putting furniture into narrow connecting spaces fearing it will make space appear smaller. It’s important to embrace the size of the room; a small room should be made to feel as cozy as possible; I often use oversized chairs or sofas which look very inviting. You should use floor length curtains in a bold design to add an extra layer of warmth to a small room; once drawn space becomes a peaceful place hidden away in a busy family home. Place sculptures in unexpected places such as entrances and hallways to add a fun and quirky design element and make space a feature in the home. Strong colour can be overwhelming in a small space. To keep the design flowing throughout the house, you can add pops of color in places you would not necessarily expect to find them. Distressed mirrors have all the benefits of standard mirror glass in terms of adding light and a greater sense of space but in addition, they provide a richness and depth which enhances the appearance of any room or space. Huge thanks to all the expert who contributed to this post. 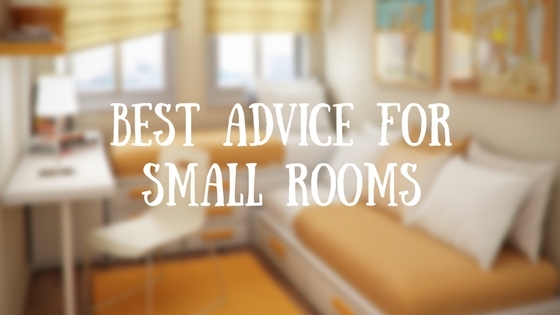 Let us know in the comments below if you have other tips on how to arrange a small room. We would love to hear your experiences. If ou enjoyed this expert roundup, please share it on social media and help us spread the word about it. The experts in this field share a lot of tips thru this post. You did a wonderful job by compiling it in a systematic way. Well done my friend. In fact, I could pick a good number of tips from this, and I will be sharing it with one of my friends who recently purchased a house, I am sure this will work wonders for his new house. Thanks for sharing. Hi Philip, thanks for the nice words! This is a great post. I just bought a new apartment and I am struggling to arrange it. I have a low budget now so these tips will really help me and my wife decorate our new home. So many great pieces of advice! Happy to be included on this fantastic list of folks! Great information- I am going to use this as a resource! So excited to be included in this article with so many fabulous interior bloggers! Great round-up! So many fab ideas here, readers are spoilt for choice! It’s a pleasure to be featured alongside so much creative advice, great post! Thank you Katherine for the tips! These are some really great tips! It’s so amazing to find out what all you can do with a small space. We are so glad to have been included amongst your experts. Great post! So happy to be a part of this with so many other great designers and bloggers!